We’d love your help. Let us know what’s wrong with this preview of Friends for Freedom by Suzanne Slade. To ask other readers questions about Friends for Freedom, please sign up. Great children's book on the friendship between two remarkable Americans who fought for equal rights for women and African-Americans! A higher reading level than Two Friends, which allows this author to delve more deeply into the complexity of the friendship between Susan B. Anthony and Frederick Douglass. It's useful for children to understand that people can disagree and still be friends. I loved this book. It highlights an important friendship between two people who were passionate about equality. Good illustrations. Solid back matter. Read aloud to 5th grade and they really liked it. A teachable approach to important 19th century, turn of century Americans who found great benefit from friendship. Fredrick Douglass and Susan B. Anthony. 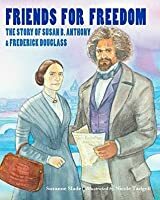 Friends for Freedom is non-fiction picture book about the little known friendship between Susan B. Anthony and Frederick Douglass. The text is simple and clear, with issues like human rights and slavery explained in accessible, but still engaging language. Soft, inviting watercolor illustrations elegantly capture fiery expressions as these two civil rights leaders passionately discuss their respective causes. (And side note--I just really love Tadgell's illustrations of Douglas Review on my blog. The recommended age group for this book is 6-9 according to the publisher’s website, and that feels about right. As a grown up reader (and writer), I especially appreciated the author and illustrator notes at the back explaining the research that went into this, and some may find the bibliography useful as well. I enjoyed how this book was non-fiction, but written as an engaging narrative of the friendship between these two civil rights activists. At first, I was skeptical, because I didn't think that Douglass was all that sympathetic to the women's movement. In fact, I thought I had read that he didn't really take the Seneca Falls Convention that seriously. This is somewhat addressed in this book when the author mentions "a disagreement," and the author does have an extensive amount of research notes a I enjoyed how this book was non-fiction, but written as an engaging narrative of the friendship between these two civil rights activists. At first, I was skeptical, because I didn't think that Douglass was all that sympathetic to the women's movement. In fact, I thought I had read that he didn't really take the Seneca Falls Convention that seriously. This is somewhat addressed in this book when the author mentions "a disagreement," and the author does have an extensive amount of research notes and sources listed. 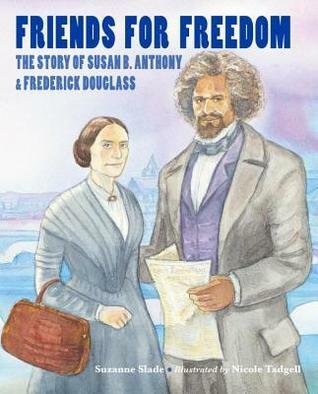 I learned a lot about the friendship between Susan B. Anthony and Frederick Douglass in this book. The back matter at the end of the book has even more information that's very interesting as well as all of the sources that were used for research. The illustrations are not my favorite style and I feel that that the cover illustration may turn students off from reading the book. But teachers can certainly sell this book by sharing some of the information! I'm impressed at how much research was done and cited in this book for middle readers. It's a great example for kids to see how author's research what they write about. Story has a great message about two very important people of the 19th century. Great pictures, text and message. It was over my four-year-old's head, so we'll try this book again at a later date. Save this book for when you're ready to address slavery. Great story about little known history fact. Loved learning more about these two civil rights activists. Engaging picture book biography of the "ahead of their time" friendship between two freedom fighters.